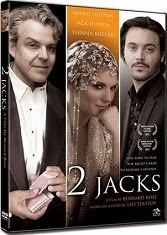 2 JACKS is the story of the legendary film director Jack Hussar (Danny Huston), notorious gambler and womaniser, who returns to Hollywood to raise financing for his next film. During a whirlwind night on the town, Jack seduces the stunning Diana (Sienna Miller). Bernard Rose reveals: The film is loosely based on the Tolstoy short story THE TWO HUSSSARS, and has, at its core the struggle of a son trying to follow in the footsteps of his famous father. As the two men's separate but similar life experiences unfold, we see that even though time and culture changes human nature does not. TWO JACKS is fundamentally about how our romantic vision of the past can prevent us from living authentically in the present”. Rough Diamond Productions presents a Julia Verdin production of a Bernard Rose film. 2 Jacks is written and directed by Bernard Rose, produced by Julie Verdin, co-produced by Ric Smith & Matt Dean, exec-produced by Danny Huston, Marcy Levitas Hamilton & Strath Hamilton, Associate producer is Jennifer Linsley Holliday. The film stars Danny Huston, Jack Huston, Sienna Miller, Jacqueline Bisset, Billy Zane, Jamie Harris, Izabella Miko, Rosie Fellner, Richard Portnow & Lydia Hearts. The film will be released in the UK on DVD and Download simultaneously on June 29, through TriCoast Worldwide, Movie Partnership (Digital) and Fusion Media Sales (DVD).